To form comparatives and superlatives you need to know the number of the syllables in the adjective. Syllables are like "sound beats". but "finding" contains two — find and ing. 3. One syllable adjective ending in more than one consonant or more than a vowel (or long vowels) — high, cheap, soft. Comparative — 'er' is added — higher, cheaper, softer. 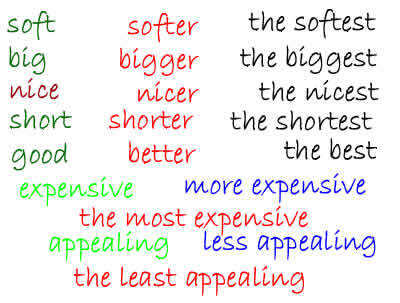 Superlative — 'est is added — highest, cheapest , softest. The Nile River is longer and more famous than the Thames. Egypt is much hotter than Sweden. This is one of the most exciting films I have ever seen. Peter is older than Charley. Charley is younger than Peter. Alan is the most intelligent. Mike is as intelligent as Nancy. Larry is as popular as Oprah. Exercises on comparatives and superlatives.